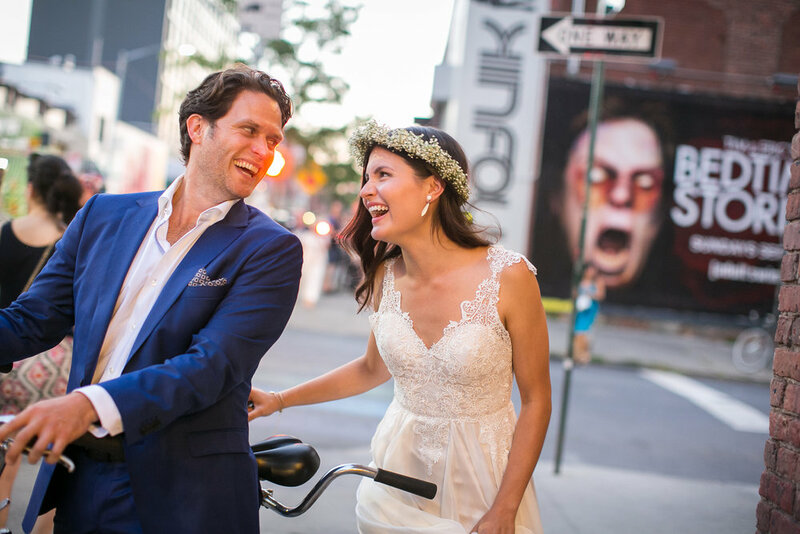 "Greens, Green and Nothing but Green"
Kermit the Frog famously declared “it’s not easy bein’ green,” but Phillipa Soo and Steve Pasquale sure proved otherwise in their nuptials. When this beloved Broadway couple first met with me to plan their wedding, their top request was that it wouldn’t feel like an opening night. They are foodies, so they wanted a delicious menu and for the overall vibe to be relaxed enough that they could enjoy each moment with their guests. They got engaged under the Brooklyn Bridge and were in the process of moving to that borough together, so we landed at the Wythe Hotel for their celebration. There was more to defining their style as bride and groom besides tantalizing the taste buds and being environmentally conscious. Many traditional wedding moments, including the processional down the aisle, did not speak to them. Every decision was still made with tremendous specificity to personalize the evening and give it a bit of theatricality. Once guests were seated for the ceremony, their officiant and I played a little scene that Pippa and Steve were nowhere to be found. After we vamped this bit the familiar sound of a horn was heard and in rode Pippa and Steve on a vintage tandem bicycle. Not only did this inspire the wedding’s hashtag, but the tone of fun was immediately established. 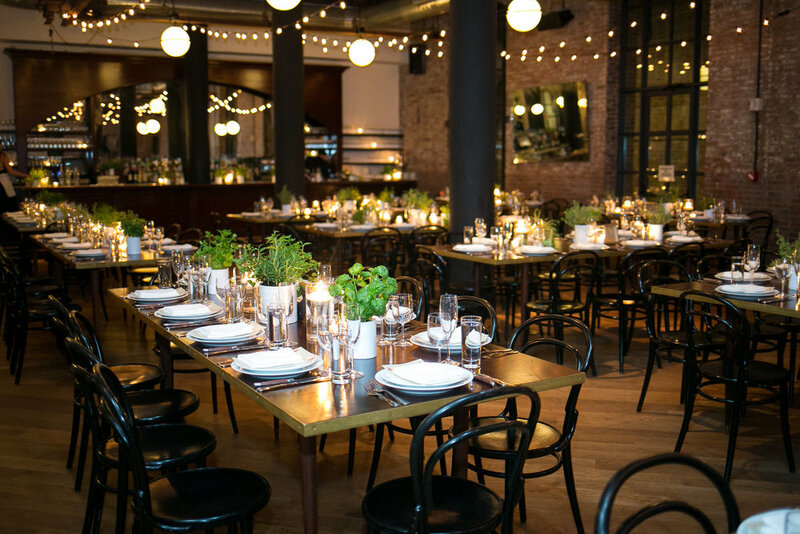 During their ceremony they were framed by hanging garland of verdant greens and Edison bulbs designed by Gatherings NY. Once cocktail hour kicked off, we parked the tandem bike in front of this installation to serve as the backdrop for the photo booth. As guests entered the reception space they were sat at tables named after meaningful locations in the lives of Phillipa and Steve, and these were beautifully written by Letters by Susanne. The wooden tables were lined with white potted herb gardens rather than flowers, and cylinders of candles in varying heights to add a touch of drama. This allowed the food and conversation to truly be the stars of the dinner. A traditional wedding cake wasn’t even an option. 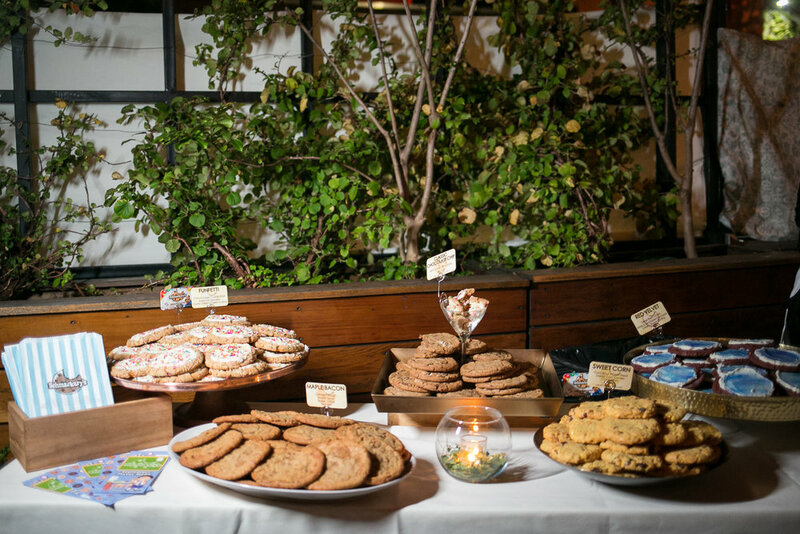 Instead, a buffet of assorted Schmackary’s paired with an ice-cream cart served as dessert. And for take-home favors, guests could choose from four different herbs offered in the “Garden in a Can.” Whether they chose basil, dill, cilantro or sage, they were supporting Back to the Roots, a company whose proceeds support making gardening and food education part of every school curriculum. The night was magical, chill, and very much Pippa and Steve.